When I first discovered Dr. Martens, I was 16 going on 17, and embracing grunge: overalls, plaids, piercings, Seattle bands like Nirvana, and a bit of androgyny. To this day, I own a pair of purple Doc loafers that are still in good condition. I actually stole them from my sister. But this month, there are two great collaborations afoot for fall and they both share a heart motif. First up: Lazy Oaf and Dr. Martens. If you haven’t heard of or seen the Lazy Oaf brand, their motto is “Keeping it weird since 2001.” The British streetwear label is colorful, non-conforming, and most of all, fun. Illustrator and designer Gemma Shiel started Lazy Oaf from a stall in Spitalfields Market, and takes her cues from teenage rebellion and youth nostalgia. It’s no wonder this new collaboration includes heart motifs and an edgy attitude. The boots include frilly ruffles and a slogan on the back strap: “My life is boring.” Why didn’t this collection happen sooner (when I was in high school)? If frills and teenage angst aren’t exactly your thing, then take a look at the new collaboration with cult skateboard label, Supreme. 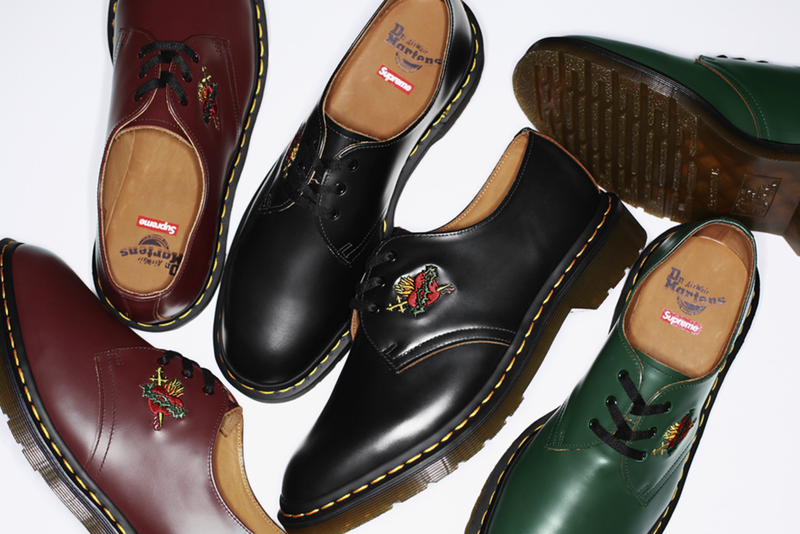 Though this is not the first time Dr. Martens and Supreme have worked together, this new crop of shoes keeps it closer to the classic design with bouncing soles and yellow stitching. There are only three colorways (black, forest green and oxblood) on the three-eye shoe with embroidered “Sacred heart” details.